You’ve probably been dreaming about it for years now. After all, one of the best parts of your teenage years is getting your driver’s license. Sometimes, however, the steps in actually obtaining your license can be confusing. For the best experience when obtaining your driver’s license, there are five main checkpoints you’ll need to cross off your list. First, it’s a great idea to take a driver’s education class to hone your skills and receive relevant information. A Driver’s Education course is your first step in becoming an educated, informed driver. In some states, these classes are even required for new drivers. In all states, one of the biggest benefits of completing a driver’s ed. course is lower insurance premiums. Insurance companies expect driver’s ed. students to get in fewer accidents and receive fewer speeding tickets due to their training. Driver’s Education courses may take place online, in a classroom, and/or in an actual vehicle, and instruction topics can range from what to do when experiencing hazardous road and weather conditions to traffic codes and laws and driver impairments. Students who have a chance to drive with a driver’s ed. instructor will be a part of an interactive teaching environment in which they will get hands-on experience in an actual moving vehicle. Students are also taught how to take important safety precautions and handle difficult driving situations. Driver’s Education course requirements and benefits are different for each state, so be sure to check with your local or state DMV office for your state’s particular requirements. After completing driver’s ed., tackling the learner’s permit written exam should be the next step on the road towards a driver’s license. A learner’s permit is also called a driver’s permit, provisional license, or learner’s license, and it’s a restricted license that teenagers can obtain while they are learning to drive. Of course, learner’s permit regulations are different for each state. The general rule is: drivers must be 18 years old to obtain a learner’s permit or 15 or 15 ½ years old to earn the permit with a parent or legal guardian’s consent. Learner’s permits often have restricted hours and are primarily used for learning purposes. In some states, teenage drivers with learner’s permits may drive to school and/or work alone with written and documented permission from their legal guardians. The standard rule is that teenagers holding a learner’s permit must drive alongside a licensed driver who is at least 21 years old. This driver must often be seated in the front passenger’s seat. Several legal documents are required to obtain the permit, as is a written exam which measures driving knowledge in areas such as “Road Rules” and “Signs.” Applicants should study ahead of time before taking the written exam and take advantage of practice tests available online. There is a small fee for the test, which also varies by state. After you receive your learner’s permit, you’ll need to get car insurance coverage. You can either choose to be covered under your own insurance policy, or you can add yourself to your parents’ or guardian’s existing insurance policy, though you aren’t eligible for your own policy until you turn 18. Teen drivers younger than 18 often must be covered under a parent or guardian’s auto insurance policy. When parents add children to their auto insurance policies, the price often increases by a fairly large amount, so it’s important to consider this beforehand. There are several auto insurance companies from which to choose, so it’s best to shop around online to find the best price for you and your family. Several auto insurance discounts, which are applicable to teenagers and their parents or guardians, are available from many insurance providers. These may include: safety equipment discounts, good student discounts (for excellent grades), multiple policy discounts, and antitheft equipment discounts. Once you have your permit and insurance coverage, it’s time to start practicing! Grab a parent, guardian, sibling, or family member who is 21 years old or older and get to work. Be sure to keep in mind the regulations of your permit. As stated, you will likely have restricted hours of driving. Make sure to follow this schedule. Also remember to keep your learner’s permit on you at all times and make sure your licensed driver/mentor is sitting in the front passenger’s seat. Many states require that you log a certain number of hours driving with a licensed adult, with a certain amount of that time allotted to night driving (within the restricted hours). States that require logged hours also require a parent, licensed instructor, or guardian to sign a certification form. Often this leads to a middle-ground step between a learner’s permit and a full license. Keep in mind this is only required in some states. Several do not require logged hours at all. Keep in mind that you can be penalized while holding a learner’s permit. In many states, if you rack up a few driving violations, you could have your permit privileges revoked. Officers do not give special preferences to beginners. After practicing for several months or years, you should be ready to obtain your driver’s license. In some states, there are different categories of driver’s licenses, dependent on one’s age. For example, some states have a “Junior” driver’s license for 16 or 17 year olds and a full license for 18 year olds. Regardless of what state you live in, you will be eligible for a full driver’s license (or operator’s license as it’s sometimes called) when you turn 18, provided you did not receive a license suspension or revocation before being eligible for the full license. 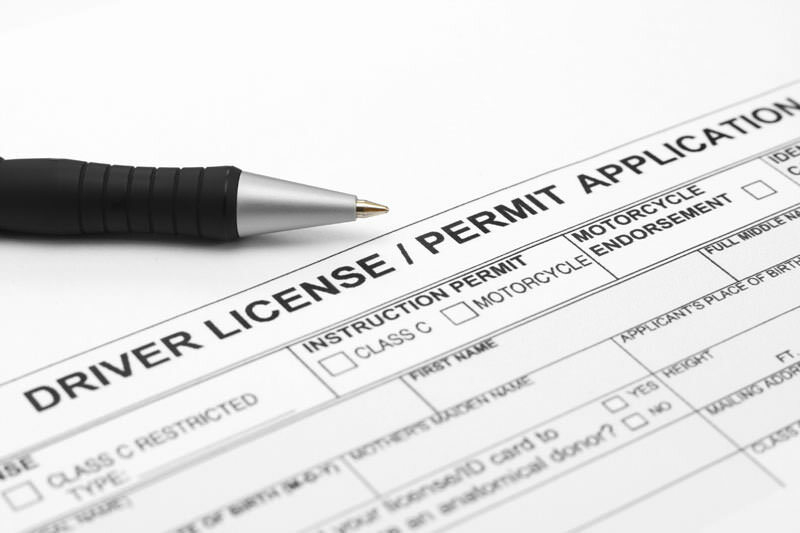 Most states allow drivers to obtain their license at 18 even if they never had a learner’s permit. If you have met all of your state’s driver’s license requirements, it’s time to make a road test appointment with your local DMV. Most states require that you make an appointment, but some do not. Be sure you bring your insurance, vehicle registration, proof of residency, learner’s permit (if applicable), and payment for your license and test fees to the driving examination. You could be tested in such areas as: parking (including parallel parking), backing up, driving in traffic, obeying traffic signs and signals, yielding to pedestrians, stopping, and judging distance. Once you pass the test and pay your fees, you’re eligible to receive your license. Congratulations! And, remember, if you don’t pass the test the first time, you can try several more times- though there is often a short waiting period.